At Wagner Wine & Spirits, you’ll find a tempting selection of excellent bourbons on our shelves. We carry bottles from all of your go-to distilleries, such as Maker’s Mark and Knob Creek, as well as a plethora of small-batch favorites like Angel’s Envy and Four Roses. Whether you are looking for an easy sipping bourbon, or looking to make the perfect old fashioned, choose a bottle from our incredible bourbon selection to add to your home bar and impress your guests or just to help you wind down after a long day. We also invite you to try one of our single barrel private selections. We travel together as a family to personally sample and select individual casks of some of the best bourbon Kentucky has to offer. Then, the respective distilleries finish, bottle and package the contents for sale exclusively at Wagner Wine & Spirits. 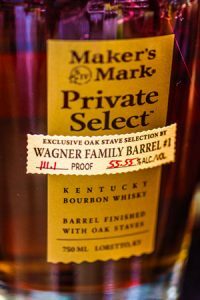 We currently have private select single barrel bottles of Maker’s Mark, Knob Creek, Jefferson’s Reserve, 1792 and Russell’s Reserve. Each of these bourbons has a uniqueness that won’t be found in standard bottles, nor in other single barrel selections, as each barrel, while similar, will be ever-so-slightly different than the others. At any rate, if you are a bourbon connoisseur, or just a bourbon lover, we have it all. From the best single barrel selections to your favorite small batch bottles, you’ll find something for everyone on our shelves. As with any of our products, if you have a question about one of our bourbons, or are looking for a particular flavor or feel, then we would be happy to suggest a bottle for you. Remember, quality bourbon doesn’t have to break the bank. We have bourbon offerings for any budget. Tell us what you like and what you want to spend, and we will find the perfect bottle for you!